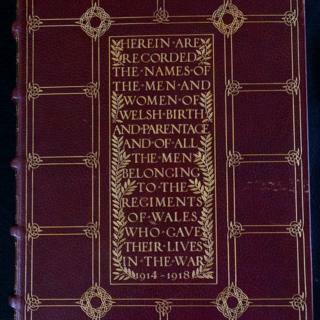 A book that holds the names of 35,000 fallen soldiers connected with Wales has been put on show in Denbighshire. The World War One book of remembrance is making a rare appearance to the public. It will be on display until 19 June in Bodelwyddan Castle. The book of remembrance, unveiled in 1928, is around 1,100 pages long and is normally held in the crypt at the Temple of Peace in Cardiff. Morrigan Mason, from the Bodelwyddan Castle Trust, said their volunteers had discovered "fascinating personal stories" behind the names in the book. The book has helped research into the post-war women's suffrage movement, the rise of the strong peace initiative in Wales in the 1920s and what happened to bereaved families. The National Library of Wales has scanned the book so that its pages can be accessed online. It has joined with the Wales for Peace organisation to allow the public to see the book and an accompanying exhibition. It is hoped people will be able to add more details about the lives of the documented fallen soldiers to the database.